Hero Awards 2011 cover art by character designer Hayama Kenji. Hero Awards 2011 BD/DVD release contents were added to the official site today. Update: It just got more amusing. And here come the manips. More at subcultureblog. At least he looks better than Boxaby in all his other suits. It’s sad when the old man is the stylish one of the duo, haha! That’s true. I think Barnaby’s dressing problem is that he tries a bit too hard to be stylish… and the artists are almost cruelly good at showing his failures (like the speedo). As much as I love Barnaby, he’s just a bit too easy to make fun of. From Boxaby to Frillaby. Good grief. In the meantime…hnngghhh, dat Kotetsu. Oh Barnaby. Always setting your own fashion trends. I kind of wished they went with the outfits the seiyuu wore like in the ones here, they are gorgeous. Call me weird but I kinda like Barnaby’s outfit… He looks nerdy-handsome to me, and maybe if you squint your eyes enough you’ll see it too. At least that suit is better than the other red one, with the million-buttons jacket. But like I said, maybe it’s just me! Kotetsu’s suit is gorgeous though. And his socks! hahaha! He obviously has water running in his basement. Oh, it’s a dutch proverb in case u don’t know, which basically means that he’s wearing slacks that are too short for him. Anyway, thanks for the post! Barnaby looks totally awesomely OTT stylish! I mean, come on — how can you *not* love it? I wouldn’t dig it IRL, but on a drawing of a guy with that impossible hair and tinted glasses it’s so ridiculous that it works. I mean, there’s so much going on, and the red and white combo…I love, love, love it. Like it or not, Barnaby has a style that is … distinctly his own; be it buttons or ruffles. I can guarantee that the art has the wtf double-take effect that the creator was going for, that’s for sure! I find it interesting that artworks since the season ended (I won’t say “series” because I’m still hoping for a season 2) have depicted Kotetsu in his Ep. 25 style- Full lips, round cheeks, much younger look; instead of the harsh angles that characterized him earlier in the series. I really, really like it. I’ve noticed Kotetsu’s long legs too, but I didn’t really pay attention to proportions. I leafed through the books to see if there was any reference to drawing his legs but I didn’t catch it. 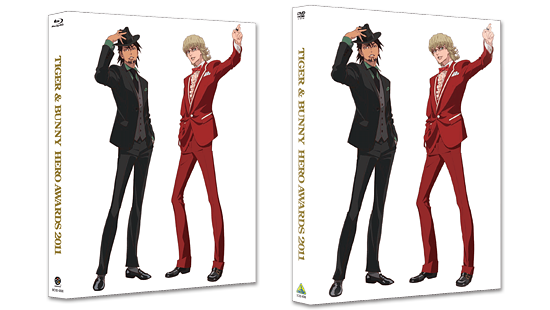 I just noticed he kinda messed up Barnaby’s body, he looks like a skinnier version of Kotetsu, even the long thin legs are there. gotta hand it to them, there – the cover is eye-catching. i’m just not sure about Barnaby’s suit… then again, this is NC1979. so i guess it’s oddly appropriate? sans ruffles, keep the piping, and the change the color, that outfit would be bangin.